Last night we caught up with our Fistula Ambassador Natalie Imbruglia via a live Twitter interview. We were delighted back in September when Natalie agreed to become our Fistula Ambassador, helping us to raise awarenss for this devestating, yet curable, childbirth injury. We asked Natalie why she wanted to get involved in our fistula work and to tell us about her own expereiences of visting Ethiopia. When did you first become aware of obstetric fistula in Ethiopia? I learnt about it in 2005 from Richard Branson. Virgin Unite took me on a field trip to Ethiopia and Northern Nigeria. I interviewed women suffering with the condition. I also interviewed the husbands, families and Emir’s (spiritual leaders). I couldn’t believe I’d never heard about Fistula when 2million women worldwide are suffering with this preventable treatable condition. How has being a Fistula Ambassador changed you? After that first field trip I could not forget about all those women suffering. I promised myself I would continue to shine a light on this issue and be a voice for them so they are not suffering in silence. As a woman it affected me deeply. I believe it’s a woman’s human right to be able to deliver their baby safely. It’s all our responsibility to nurture and protect women and mothers around the world. Child birth should be a joyous occasion, a celebration of life, not the beginning of a life with fistula, which can tear apart the family unit. What do you like most about being an ambassador? I like giving people an opportunity to help themselves and using my profile to draw attention to matters that are close to my heart. I love getting to learn about other cultures. I now have more compassion for people and a respect for our differences. These women have inspired me. I’m also inspired by those who work tirelessly to help them. It makes me want to be a better person, to do more to help. My heroes are people like Catherine Hamiln, who founded the first fistula Hospital in Addis Ababa and Allison Shingo who founded Healing Hands of Joy in Mek’ele. Both of these women have dedicated their lives to helping women with Fistula. Is there a story that has particularly touched you? On my last field trip to Ethiopia to visit Healing Hands of Joy I met a woman who had been suffering with fistula for 22 years. We approached her with one of the Safe Motherhood Ambassadors who had gone through the program at HHOJ. She had already had a successful fistula surgery, been educated and reintegrated into society. I watched this women inspire the other to finally come forward and have the courage to seek help. The women who had been suffering for 22 years went on to have fistula surgery. When we support each other we can find courage we didn’t know we had. This woman’s life was given back to her. This really touched me. Why do you support Ethiopiaid? Ethiopiaid has partnered with the Ethiopian Government on their Campaign to Eradicate fistula by 2020 in Ethiopia. I’m really excited about this campaign and I wanted to be part of the amazing work that Ethiopiaid is doing to help these women. What other charities do you support? 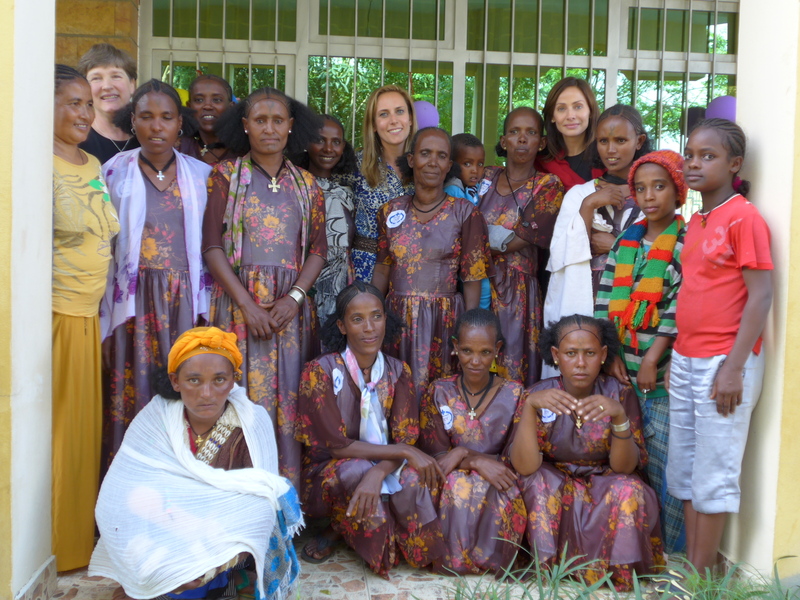 My main focus is women with fistula; I support Virgin Unite, Ethiopiaid and Healing Hands of Joy. But as its World Water Day (22nd March) I should draw your attention to Drop4Drop who do amazing work around the world to ensure people have clean drinking water. I also support Big Change whose mission is to transform the way we support the next generation. You should check out their site. What do you hope for the future of maternal health? My hope is that women all over the world will be supported to deliver their babies safely. There are already solutions, we just need to work together with the governments and Emirs to make this happen sooner rather than later. Ethiopia is on its way to making this a reality my hope is it that other countries will follow their lead. My mother and father have inspired me by working full time jobs and raising 4 strong powerful women! I will forever be grateful for the sacrifices they made for us. As I mentioned earlier, Catherine Hamlin and Allison Shingo inspire me because they have dedicated their lives to helping women with Fistula. Richard Branson has also inspired me, not only is he a successful business man, he is an amazing father who has instilled great values in his children. If it wasn’t for Richard and Virgin Unite I would never have known about women with fistula. Have you ever been to Ethiopia? What do you like about the culture? I have such fond memories of Ethiopia. My first visit was to The Hamlin Fistula Hospital in Addis Ababa. It was so impressive and the staff were so loving to all the women being treated. When a woman there is repaired of fistula they all sing a song and they present her with a new dress. I will never forget seeing the joy on their faces, to finally be dry after so much suffering. It was fantastic. The people were very graceful and friendly and I loved the food!!! On my last trip I saw some beautiful lush landscape. I definitely want to go back. If there was a person from history you could follow on social media who would it be? Oscar Wilde … for his Wit! I have so many but I love Mattdraperphotography for his underwater photography. His pictures take you to another world, just stunning. A big thank you to Natalie for giving up her time to talk to us, we look foraward to working with you!